Do you have a birthday or a special anniversary coming up and, rather than presents, would prefer people to give to a cause you believe in? Are you motivated to help send kids in financial need to space camp or support our other science, technology, engineering, arts, and math (STEAM) initiatives by helping to raise funds from your community? Perhaps you want to simply bring more of your friends into our TMG community? Setting up a personal fundraising page can be a great way to help TMG and feel good too! Below is a guide for how to setup a fundraising page for The Mars Generation. Once you set up your page make sure you check out our page “How To Rock Fundraising for the TMG Cause page” for tips on making your fundraiser a success! This tutorial is for setting up an individual fundraising page for The Mars Generation. It’s easy to setup an individual fundraising page and start raising funds for The Mars Generation. All funds that you raise automatically go to the organization, your donors receive tax receipts and have a record for future reference of their donations. We are fortunate to have free access to a giving website that is run by the Saint Paul Foundation in Minnesota (we are based in Minnesota) that allows us to utilize this powerful way to raise funds. 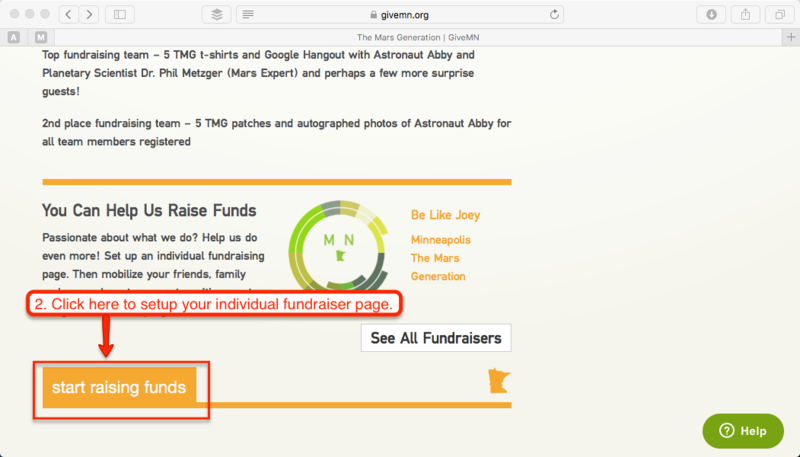 You will use the GiveMn.org site to setup your page and raise funds for TMG. Please follow our simple guide below for setting up your own individual and/or team fundraising pages. If you have any questions feel free to contact us at groundsupport@themarsgeneration.org and we will be happy to assist you. We advise you open two browser windows when setting up your page and use this sample page Give To Mars Day Fundraising page for content for your page. Add the reward levels for donation exactly as we have worded so people know that by donation they get space swag too! This is your best tool to get people to give. They can get great space swag as rewards too! 1. 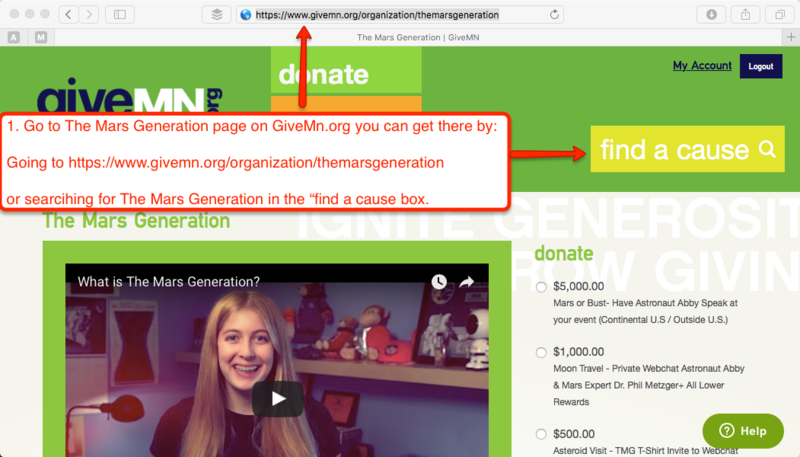 Go to The Mars Generation GiveMn page at: https://www.givemn.org/organization/themarsgeneration – alternatively you can find our page by conducting a search in the search bar on the upper right hand side of the GiveMn.org website. Please make sure you are on the official The Mars Generation page. ***Note you will need to setup an account with GiveMn when creating your page. It’s simple and will allow you access to your fundraiser at all times. Step 1 – Pick the organization you want to fundraise for. This should already be populated with our organization name but if not start typing “The Mars Generation” and select our organization from the list. Step 2 – Name your fundraiser. It is good to identify your own name and the cause or event. An example title would be: “Sarah B’s TMG Train Like A Martian Fundraiser” or “Help send kids to space camp fundraiser by Astronaut Joey.” you are free to use first and last name if you would like or whatever name your friends and followers will identify with. Headline – Make this creative to capture interest. Tell Your Story – Make this personal and creative. Why are you fundraising and why it’s important to you and why others should support the organization. You need to sell your fundraiser here. Thank Your Donors – It’s important you write a personalized thank you for your donors (write it in first person and sign it with your name). You want people to know you are appreciative. This is an automated email that will go out after they donate. We also recommend you thank them online if they are online and/or write a personal email to them Remember fundraising is about relationships. Manage Images and Videos – Add some TMG photos/Videos (you can find photos and logos on TMG website and social media channels and video on Astronaut Abby You Tube). Manage Your Donation Form – Setting up “Suggested Giving Amounts” and descriptions. If you are tying this event into a bigger TMG event such as our Train Like A Martian event you can use our giving levels and reward levels as well. Fundraising Thermometer – you can add a start and end date to the campaign and setup this monitor with a goal to help encourage donations and track your success. Setting a goal and tracking it can help you raise funds – people like to help you reach goals. Manage Matching Gifts – If you have someone who offers to give a matching gift you can set that up here. This is a great way to double your donations – let’s say someone says I will match the first $250 donated you can set that up here. Remember you are able to come back to this page anytime you want to change things, view your donation reports and also get code if you want to add a donation widget to your own website or blog that links back to your donation page. It’s pretty cool once it is all setup. Make sure to save the page and you are set to go. 5. Share your fundraiser with your fundraiser page URL and start asking for people to donate. Be polite online when asking, do not overwhelm your followers with asks, do not spam people asking one person after another to donate on Twitter would be spamming. You can also send the link in email to friends and families. Makes sure to tell them why you are asking for them to join you in this cause.